The Sputnik Program was a series of five space missions launched by the Soviet Union in the late 1950s. There are a variety of other classes of Soviet spacecraft that are referred to as "Sputniks" by Americans, however only the first five were part of the Soviet Sputnik Program. The first of these spacecraft, Sputnik 1, was the first artificial satellite ever to be launched into orbit, effectively starting the "Space Race" between the United States and the Soviet Union. Ukrainian Sergei P. Korolev, a rocket designer in the Soviet ICBM program, is widely regarded as the founder of the Soviet space program. In 1944, Korolev had designed the Soviet equivalent to the German V2 missile, the R-1. Several design changes later, in 1957 Korolev's R-7 was created, powerful enough to put a satellite into orbit. As participants in the "International Geophysical Year", the Russians were working on a satellite with a scientific payload, but progress was slow, and there was an urgency to beat the Americans into space. Since the R-7 was ready, Korolev's team designed a barebones satellite, a simple beeping orbiter, which became known as Sputnik 1. Sputnik 1 was launched on October 4, 1957. The satellite was 23 inches in diameter and weighed approximately 184 lb. Each of its elliptical orbits around the Earth took about 96 minutes. Set up to broadcast a beep on 20 and 40 MHz frequencies, its signal was received both by scientists and amateur radio operators worldwide for 22 days until October 26, 1957 when the onboard batteries ran out of charge. Sputnik 1 was also outfitted with instruments to measure the density of the Earth's atmosphere. Calculations based on the last signals received from the satellite and the degradation of its orbit project that Sputnik 1 burned into the atmosphere on January 4, 1958. Some evidence indicates that parts of the spacecraft survived re-entry. had her own separate sealed cabin. 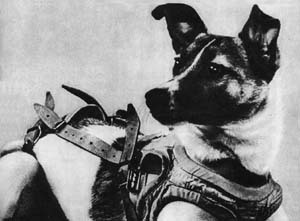 Originally reported to have survived 7 days, documents released in 2002 revealed that Laika perished from overheating several hours into the spaceflight due to malfunctions in the thermal control subsystem. As tragic as this seems, the original plan was to euthanize Laika after 10 days with poisoned food, as there was only enough oxygen to last 10 days. There was no re-entry plan. After 162 days on orbit, Sputnik 2 reentered the atmosphere on April 14, 1958. The Sputnik 3 satellite was launched on May 15, 1958 with the intent of studying the ionosphere. This was the satellite that had originally been slated for the first Soviet launch. Sputnik 3, like Sputnik 2, was conical in shape, and weighed about 2,926 lbs. It carried 12 scientific instruments designed to study the pressure and composition of the atmosphere in its upper layers; concentration of charged particles, photons in cosmic rays, heavy nuclei in cosmic rays, magnetic and electrostatic fields, and meteoric particles, as well as measure the temperature in the spacecraft and on its surface. Due to a failure of its onboard tape recorder, data could only be collected from Sputnik 3 during space to ground radio contacts. Sputnik 4 remained in orbit until April 6, 1960, when the orbit degraded from drag in upper atmosphere and the spacecraft burned into the atmosphere. Sputnik 4 was launched on May 14, 1960, designed to investigate the means for manned space flight. Weighing approximately 3,256 pounds, it contained scientific instruments to study the operation of the life support system and the stresses of flight, including a television system, and a self-sustaining biological cabin with a "dummy" of a man. Sputnik 4 orbited the Earth for four days, then was scheduled to release a re-entry cabin. The cabin released, however retro rockets designed to de-orbit the cabin fired with incorrect attitude data, pushing the cabin further out into space. The capsule eventually re-entered the atmosphere on September 5, 1962, leaving at least one of it's pieces in Manitowoc, Wisconsin, USA. 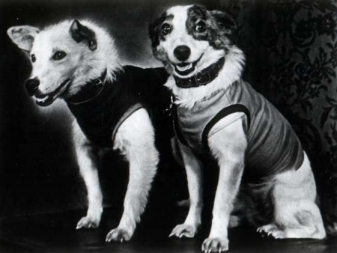 Due to SOS signals received from the vicinity of Sputnik 4 on November 28, 1960, some sources suggest that this flight was actually manned by a human. rats, forty mice, various plants and a human mannequin "Ivan Ivanovich". Sputnik 5 weighed 10,141 pounds, and returned to the Earth after one day of orbiting on August 20, 1960. The Sputnik Program was followed by the Soviet Vostok Program, which went on to carry the first human into Space. Both Sputnik 4 and 5 are also considered part of the Vostok Program. The Sputnik Program had significant military implications to the world: the ICBM missiles used to launch the Sputnik satellites were also capable of traveling from the Soviet Union to their military targets in less than one hour. Conventional bombers would take several hours for the same flight. The Soviet's status as a very formidable foe to the United States was cemented and the tensions of the Cold War were heightened. In the late 1950's, the Soviet Union saw itself as the stronger of the superpowers in both the Space Race and the Cold War. While the United States Navy and Air Force were working on their own space missile projects prior to the launch of Sputnik 1, this event spurred the U.S. Government into creating the Defense Advance Research Projects Agency (DARPA) in February of 1958, and the National Aeronautics and Space Agency (NASA) in July of 1958. The National Science Foundation received almost $100 million more in appropriation funds from the U.S. Congress in 1959 than the previous year. The fear of losing the Space Race also prompted the advancement of the educational system in the United States; Congress passed the National Defense Education Act (NDEA) in 1958. The NDEA boosted funding for both higher education institutions, and elementary/secondary education, with an emphasis on math and physical science. The International Geophysical Year lasted from July 1, 1957 to December 31, 1958. Both the USA and the USSR were participating in this international scientific event. Although the launch of Sputnik 1 is often cited as the beginning of the Space Race, both countries were already racing to become the first space power. Because the Space Race occurred during the Cold War, secrecy was a necessarily. Due both to the secrecy of these Soviet space missions and disinformation tactics, many facts about the Sputnik satellites are disputable. Many classified documents have since been released to the public, but many secrets have been kept secret. This page is copyright © 2007-12, C.T. Evans and T. Alcorn.